If you follow me on Instagram, you might notice that I have been posting protein waffle pictures on the weekends. It's kind of funny because up until about a month ago, I had never actually made waffles. The only reason we have a waffle iron is because I bought it for Jason several years ago because he was always talking about wanting to make waffles for breakfast. I'm actually not a big breakfast foods kind of person. I never wanted toast and eggs, pancakes or waffles. Bacon and sausage never appealed to me, especially not now as a vegetarian. The only time I really wanted waffles was when my dad took my sister and I to this diner as children. It was called Mrs. T's. The waffles were as big as the plate, and my sister and I could easily inhale 2 waffles! Of course every crevice had to be perfectly filled with the correct blend of melty butter and oozing syrup. Maybe it was seeing so many waffles on Instagram or recipes on Pinterest, but I suddenly decided I wanted some waffles. I had been making myself some protein pancakes occasionally, but I wanted something crispier, with more texture. I found one recipe that I tried out. The flavor was good, but it was incredibly dense. I decided to go back to the protein pancake recipe I had been using and see if I could tweak it to make waffles. 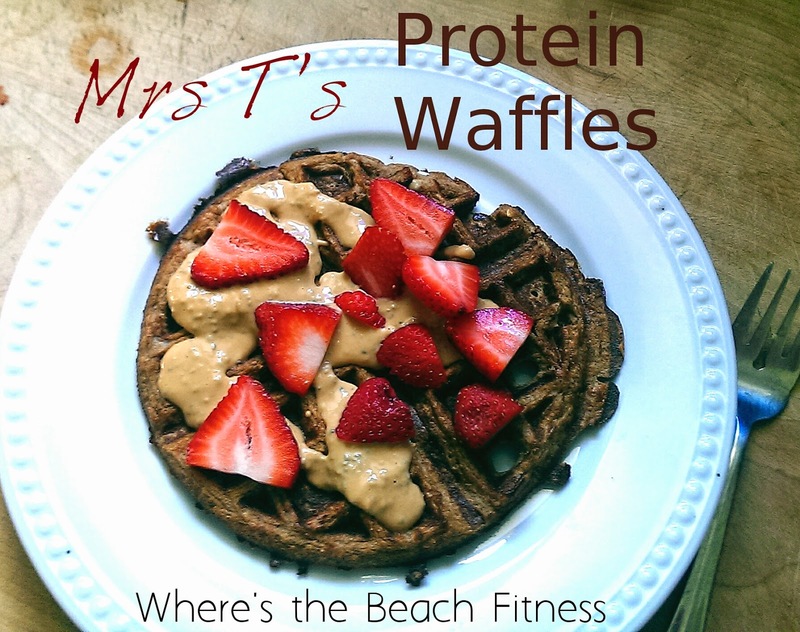 In honor of my memories of my dad and Mrs. T's Diner, surely it's appropriate to call these Mrs T's Protein Waffles. In a blender*, combine all ingredients starting with a small splash of almond milk. Blend until smooth adding additional almond milk as needed. Pour into your waffle iron and cook as you would any waffle. This makes 2 larger waffles depending on the batter consistency. I like to stick them into the toaster oven for just a minute to crisp them up at the end. *If you do not have a high powered blender, I suggest using a coffee grinder to grind the oats into a flour before mixing with the rest of the ingredients. I usually top my waffles with whatever fruit I have on hand along with a peanut flour drizzle. I simply combine PB2 with liquid stevia and water to desired consistency. Do you prefer waffles or pancakes? Any fun memories of waffles from childhood? You know, my husband wanted a waffle maker SO badly when we got married that we added one to our wedding registry; the first time he tried it he made a HUGE mess (a little too much batter, I think) and it was relegated to the back of the cabinet! I do love waffles, though, and I'm so glad you posted this recipe! Thank you!